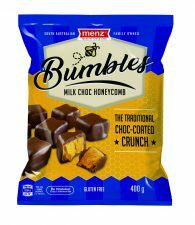 Following extensive consumer research and analysis of market trends Australian confectioner Robern Menz’s, Menz Choc Honeycomb will be rebranded as Menz Bumbles. Fourth Generation Family-owned Robern Menz felt that its branding needed a refresh to appropriately represent the product and reflect its core brand ethos. Menz Bumbles is made from a traditional homemade recipe, featuring crumbly sweet honeycomb smothered in a generous choc coating. Its new name and packaging has been designed to appeal to a market that are drawn to a product that is reminiscent of old-fashioned, traditional confectionery from their childhood. Menz Bumbles will be available in a variety of pack sizes and is gluten-free. It is available in Milk, Caramel and Dark Choc varieties in supermarkets, variety stores, and independent retailers.